The Geneva – Breeches Bible translation. Here on the site, we have the more readable and modern version, the King James version of the bible in many languages and it has been downloaded thousands of times, but I have been asked to provide some of the lesser known versions as well. The Geneva-Breeches Bible is about half a century older than the King James Bible, and it was the Bible used by William Shakespeare and the whole Protestant world of the time. The Geneva Bible is here presented in a version formatted for ebook-readers. The Geneva-Breeches Bible is about half a century older than the King James Bible, and it was the Bible used by William Shakespeare and the Protestant world of the time. 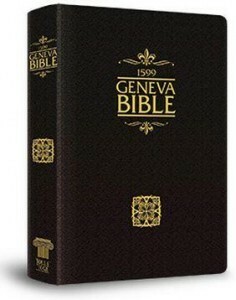 I would like to send me please a free copy of Geneva Breeches Bible.My address lacatus saveta str. Habuta 378 Patrauti Suceava.Románia.Waite youre answer.Be blessed. God bless you, that you prosper in your desire to see His word multiply.Be Blessed.